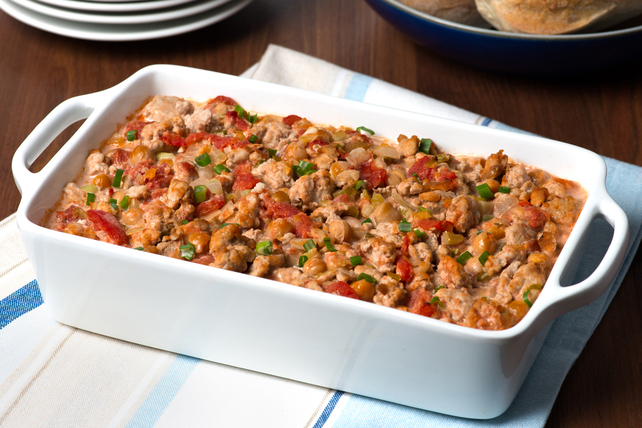 Equally delicious when prepared with either turkey or chicken, this Caesar dressing-spiked casserole is sure to be a hit with the entire family. Heat oil in large skillet on medium heat. Add celery, peppers and onions; cook 3 to 5 min. or until vegetables are softened, stirring occasionally. Add turkey; cook 5 to 7 min. or until done, stirring frequently. Stir in remaining ingredients. Spoon into 2-L casserole dish sprayed with cooking spray. Serve with hot cooked rice or warm rolls.